This simple but fun tale of a lemonade stand offers lessons on competition, marketing, and product testing. Olivia has always wanted to open a lemonade stand. She’s got the marketing down pat but struggles with both her product and her friend Francine’s competing pink lemonade stand up the street. Olivia turns her stand into a restaurant and partners with Francine to offer pink lemonade to her customers. This is a fun, simple picture book that will entertain your girls while also providing examples of basic business concepts. Olivia has a knack for marketing. She refers to her lemonade as “Olivia’s Lemony Lemonade” and “Olivia’s Super-Sour Lemonade” depending on what she thinks will work best with each customer. One of Olivia’s failings is that she doesn’t test her own product. She doesn’t taste her first batch of lemonade until after her brother tells her it’s too sour. She makes a second batch but doesn’t taste that one either. After a customer complains that it’s too salty, she realizes that she used salt instead of sugar to sweeten the recipe. Competition is a strong theme in the book. 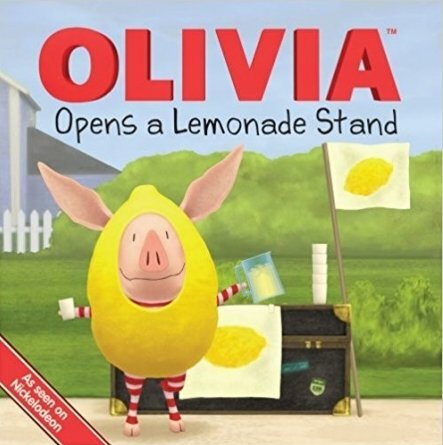 When Francine sees that Olivia has put salt in her lemonade she shouts to customers about her strawberry lemonade, “It’s pink and yummy and unsalted.” After Olivia sees that Francine has been more successful selling strawberry lemonade, Olivia changes her business to a restaurant. One could argue either that it was a smart pivot away from a stronger competitor or that she should have tried to compete in another way. But when Olivia’s friends announce at her restaurant that they will only eat pink food, Olivia buys strawberry lemonade from Francine and ultimately suggests a partnership through which she sells Francine’s lemonade in her restaurant. Other business topics touched upon in the book include pivoting or changing your business, partnerships, and building a team. Before she launches that first or next business, make sure she tries the product herself. Next, have her enlist other testers to make sure the product is as she expected. Whether that’s a willing (or unwilling) sibling, friend, or parent, a panel of product testers (especially filled with people who are not afraid to tell her bad news!) can go a long way in making sure that her product is the best it can be. 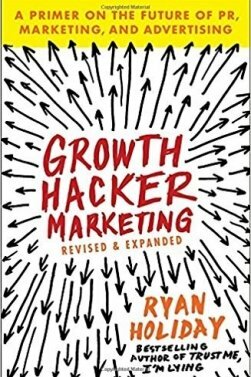 My favorite book about marketing is Growth Hacker Marketing: A Primer on the Future of PR, Marketing, and Advertising by Ryan Holiday. Growth hacking is a mentality that focuses on testing, tracking, improving, and scaling in a continuous loop until it creates a self-perpetuating marketing machine that reaches millions by itself. This book walks the reader through how to ensure product market fit, find the first passionate users, optimize the outreach to those users, and build a viral loop. Sign up and you’ll be the first to know about The Startup Squad book releases, cool contests, and other smart girl news. Do you like our book club emails so far? We’d love to know how we can make them better for you and the young entrepreneur in your life! Shoot us an email with any comments, questions, or feedback you have. Thanks!